Figure 1: Antarctic historical / long-term surface temperature map. Red shading represents areas where temperatures have increased the most during the last 50 years, of note West Antarctica. Light red to white shading represents areas where temperatures have slightly increased to not at all respectively, of note East Antarctica. (faults lines by J. Kamis, temperature trends are in °C/decade by Eric Steig, University of Washington, with NASA/GSFC Scientific Visualization Studio). Another giant piece of the climate science puzzle just fell into place, specifically that geological heat flow is now proven to be the primary force responsible for anomalous bottom melting and break-up of many West Antarctica glaciers, and not atmospheric warming. This new insight is the result of a just released National Aeronautics and Space Administration (NASA) Antarctica geological research study (see here). Results of this study have forever changed how consensus climate scientists and those advocating the theory of Climate Change / Global Warming, view Antarctica's anomalous climate and climate related events. In a broader theoretical sense, results of the NASA study challenge the veracity of the most important building block principle of the Climate Change Theory, specifically that emissions of CO2 and carbon by humans is responsible for the vast majority of earth's anomalous climate phenomena. This article will provide evidence that geological forces associated with major oceanic and continental fault boundaries influence and in some cases completely control a significant portion of earth's anomalous climate and many of its anomalous climate related events. The article is divided into four basic segments. Review of how the NASA West Antarctic Geological Study perfectly fits, compliments and proves that the West Antarctic Rift / Fault System greatly influences Antarctic climate and climate related events. How generation of many Antarctic anomalous climate and climate related events are caused by geological forces. How modern day anomalous melting of Arctic Sea Ice is the result of increased heat flow and chemically charged heated fluid flow from two major fault boundaries. How El Nino / La Nina Cycles are generated by increased heat flow and chemically charged heated fluid flow from the Papua New Guinea / Solomon Island oceanic and continental fault region. The NASA West Antarctic geological research study concluded that a large portion of West Antarctica, specifically the 620,000-square mile and glacial ice-covered Marie Byrd volcanic region, is underlain by an actively heat flowing "Mantle Plume". Mantle plumes are non-moving powerful world class size deep inner earth fed and upward migrating columns of hot lava and associated high heat flow. These upward flowing plumes of hot lava material tend to mushroom outward as they near earth's bedrock surface layers. Once formed, the large bedrock surface expression of mantle plumes typically remains constant in area. However, mantle plumes are dynamic geological features. Frequent sudden increases and decreases of volcanic activity within sub-areas of the plume area are very common. The Mantle plumes can best be described as constant size, dynamic, and extremely powerful geological heat flow engines. The Yellowstone National Park volcanic region, which is fed by a large constant size mantle plume, is a good example. Here sub-areas such as hot geyser basins, location of earthquake swarms and position of shallow depth deep volcanic activity constantly vary in intensity. In a geological time frame, the Yellowstone mantle plume appears to migrate from southeast Idaho to its current location in northwest Wyoming. This apparent migration of Yellowstone plume is actually continental drift movement of shallow bedrock layers across the stable position of the deep earth mantle plume. Next let's turn our attention to the Antarctica Continent wide map atop this article (Figure 1). This map illustrates several important geological features of Antarctica; location of West Antarctica's Marie Byrd mantle plume, location of the West Antarctic Rift / Fault System, and most importantly, color shading of Antarctica's 50 year anomalous surface temperature heat flow regions. This once controversial map has now been proven correct by several studies including a just released study by the British Antarctic Survey (see here). The map was considered controversial because it clearly showed that geological forces and not just human induced Global Warming / Climate Change were at work in Antarctica. A more regional view of the Antarctica Continent, adjacent oceans and relevant geological features is illustrated in the Figure 2 map. This map more properly illustrates the full extent of the West Antarctic Rift / Fault system, location of Antarctica's volcanoes and location of the Marie Byrd mantle plume. The 5,300-mile-long West Antarctic Rift / Fault System is actively ripping the entire Antarctic Continent apart and is home to 149 volcanoes erupting / active / semi-active volcanoes. Seven of the volcanoes along the fault are erupting, two sub-glacially. The fault system extends a great distance into adjacent ocean waters thereby demonstrating that it is a world class size fault boundary that is an integral part of earth's continental drift / plate tectonics puzzle. It is here contended that the West Antarctic Rift / Fault System generates and fuels all West Antarctica's geological features. Heat flow and chemically charged heated fluid flow from these features acts to greatly influence or control much of Antarctica's anomalous climate and many of it's anomalous climate related events. Details substantiating these contentions can be found by reviewing many previous Climate Change Dispatch articles (see here, here, here, and here). Figure 2: Regional view of West Antarctic Rift / Fault System west and east fault branches, erupting/active/semi-active volcanoes, and the Marie Byrd mantle plume. Generation of a huge interconnected sub-glacial liquid freshwater system of streams and lakes is caused by bedrock geothermal heat flow and chemically charged heated fluid flow (see here, here, and here). This stream and lake system drains downhill into adjacent ocean areas acting to warm and chemically charge these ocean areas. Climate Change has nothing to do with generation of this sub-glacial liquid freshwater system. The anomalous and rapid alteration of West Antarctica and East Antarctica marine animal migration patterns is the result of geologically induced heat flow and chemically charged heated fluid flow. (see here, here, here, and here). This anomalous geological warming and chemical charging of Antarctic oceans forces marine animals to migrate to other more suitable areas. Occurrence of anomalous ocean plankton blooms in open ocean and sea ice covered ocean areas is caused by geologically induced chemically charged heated fluid flow (see here, here, and here). This process alters seawater nutrient content (iron, phosphate, carbonate), ocean temperature and ocean current patterns thereby influencing plankton blooms. Chemically charging of huge ocean areas adjacent to West Antarctica with methyl-mercury is a natural occurrence related to chemically charged emissions from ocean floor volcanic features (see here ). "Flash Draining" of West Antarctic sub-glacial liquid freshwater lakes is caused by dramatic changes in bedrock geothermal heat flow. (see here, and here). Methane gas seeps in the South Georgia and South Sandwich Islands area which are the northern extension of the West Antarctic Rift are caused by geological heat flow (see here). Generation of the Antarctic Maude Volcanic Platform "Polynya" (anomalous ice free hole) is the result of increased heat and heated fluid flow from the active ocean floor geological features of the Maude Volcanic Plateau (see here). Given that the West Antarctic Rift / Fault System is now proven to be a powerful climate altering force, it is reasonable to reconsider the potential climate altering force of other oceanic and continental fault boundaries such as the Mid- Arctic Rift / Fault System (MARFS) and the Aleutian Island Convergent / Fault System (ALCFS). It is here contended that these two-major rift / fault systems have a very strong influence on Arctic Sea Ice melting. First let's discuss the geological heat flow and ice melting power of the 4,300-mile-long Mid-Arctic Rift / Fault System which lies on the eastern margin of the Arctic Sea Ice. The ocean floor location of this rift is shown on the Figure 3 map. It is a rift which up until very recently has been characterized as "inactive" for two reasons; lack of large earthquakes and emission of only minor amounts of heat and heated chemically charged heated fluid flow including methane gas. This characterization has recently been proven incorrect. New research by the Alfred Wegner Institute shows that lack of large earthquakes from the MARFS is not a direct or reliable indicator of the amount of geologically induced heat flow or chemically charged heated fluid from this system. To the contrary, this research study proved that the MARFS experiences frequent small earthquakes located at great depth along the fault. In addition, the study suggests that the MARFS likely emits large amounts of geologically induced heat and methane gas (see the quote below, here, and here). The study shows that the MARFS is actually very active. Concerning the…"ultra-slow moving arctic…rift Initially, we were very surprised that areas without earth crust showed no earthquakes at all down to 15 kilometers depth, even though OBS were positioned directly above. At greater depths and in the adjacent volcanic areas, on the other hand, where you can find basalt on the sea floor and a thin earth crust is present, there were flurries of quakes in all depth ranges," says Vera Schlindwein about her first glance at the data after retrieving the OBS with RV Polarstern in 2014. The results also have an influence on other marine research disciplines: geologists think about other deformation mechanisms of the young oceanic lithosphere…Oceanographers are interested in heat influx and trace gases in the water column in such areas, which were previously thought to be non-volcanic and "cold". Biologists are interested in the increased outflow of methane and sulfide on the sea floor that is to be expected in many areas and that represents an important basis of life for deep-sea organisms" (see here). Another example that the Mid-Artic Rift / Fault System (MARFS) is very active occurred during the March 6-10, 2014 time frame. This is when the MARFS and the western Greenland Baffin Bay / Labrador Sea Rift / Fault System both pulsed massive amounts of methane gas into the overlying ocean column (Figure 3). These long (1,400 and 1,800 mile) linear methane gas pulses migrated vertically upward through the ocean column and into earth's atmosphere. Here they were recorded by gas sniffing NOAA satellites. It is here contended that these methane gas pulses are the result of a sudden and massive pulse of geologically induced heat flow from the above mentioned major rift / fault systems. Details of how this process works is as follows. The above-mentioned rifts/faults connect downward into deep earth magma (hot lava) pockets. When these magma pockets shift or become reactivated they expulse massive amounts of heat, or in some cases, heat and hot lava. The expulsed heat and lava are propelled upward along the fault plane to the bedrock / seafloor interface. Here the heat melts frozen methane trapped in shallow bedrock layers (methane clathrates). The now free flowing methane gas migrates upward through the ocean column and into the atmosphere. The above mentioned Mid-Arctic Rift/Fault System methane/heat pulse is a significant event. An Event which indicates that the Mid-Arctic Rift / Fault System is the most probable cause of recent anomalous melting along the eastern margin of the Arctic Ocean Sea Ice. In addition to this one-time event it is important to note that other seafloor locations along the Mid-Arctic Rift / Fault System constantly emit large amounts of methane. This is yet another indication that the rift is currently very active. Figure 3: This map illustrates two massive seafloor methane gas releases / plumes (red hatched) which where pulsed from the Mid-Arctic Rift / Fault System (M-Arctic Rift) and the Baffin Bay / Labrador Rift / Fault System (B-L Rift) on March 6-10, 2014. The methane gas plumes rose vertically upward through the overlying ocean column and into the atmosphere. There recorded by NOAA gas sniffing satellites. Deep submarine and remote vehicle dives onto the seafloor expression of the Mid-Arctic Rift / Fault system have recorded hundreds hydrothermal vents and volcanoes that are flowing huge amounts of chemically charged super-heated fluid (Discovery of Abundant Hydrothermal Venting on the Ultra-Slow Spreading Gakkel Ridge, Arctic Ocean, Evidence of recent volcanic activity on the ultraslow-spreading Gakkel Ridge, and Scientists Discover Giant Volcanic Eruption in Arctic Ocean). A portion of Greenland anomalous bedrock heat flow is likely from a proven deep earth mantle plume (see here). A significant portion of the bottom melting of Greenland's glaciers is associated with the geologically induced heat flow from the active Mid-Arctic Rift / Fault System (Greenland Ice Melt Geothermal, Not Man-Made). Iceland's extremely active modern day volcanism is fueled by the southern extent of the Mid-Arctic Rift / Fault System (Plate boundaries, rifts and transforms in Iceland, Iceland is Experiencing its Biggest Continuous Volcanic Eruption in Centuries, and What Happens When A Volcano Erupts Under A Glacier? ). A recent hole punched in the Arctic Sea Ice directly above a portion of the Mid-Arctic Rift / Fault System is proof that this rift can pulse sufficient amounts of heat to melt through even the thickest parts of the Arctic Sea Ice (Heat from Deep Ocean Fault Punches Hole in Arctic Ice Sheet). Next let's discuss anomalous modern day melting of the western margin of the Arctic Sea Ice. This melting is here contended to be caused by heat flow and chemically charged heated fluid flow from a major oceanic / continental fault boundary, the Aleutian Islands Oceanic / Continental Convergent Fault System (Figure 4). This fault system has in recent years had the power to warm the entire Bering Sea. The geologically warmed water is carried north by ocean currents which then funnel it through the Bering Strait and into the western Arctic Ocean where it acts to melt the western margin of Arctic Sea Ice. Support of this contention comes from three lines of evidence; sudden alteration of Bering Sea marine animal migration patterns / populations, recent and sudden change in the Bering Sea ocean temperature as per NOAA Sea Surface Temperature (SST) Maps, and the presence of numerous Bering Sea volcanoes. Sudden alteration of the Bering Sea's marine animal migration patterns and populations include; sudden and dramatic changes of Pollock and Walleye migration patterns during the year 2014 (see here) and changes in walrus and seabird populations (see here). After seven years of cold temperatures the entire Bering Sea suddenly and completely became anomalously warm as shown by NOAA SST Maps (see SST Map 9/8/2014 ). The magnitude and suddenness of this change does not fit the constant and moderate increase in earth's atmospheric temperatures during the last two decades. 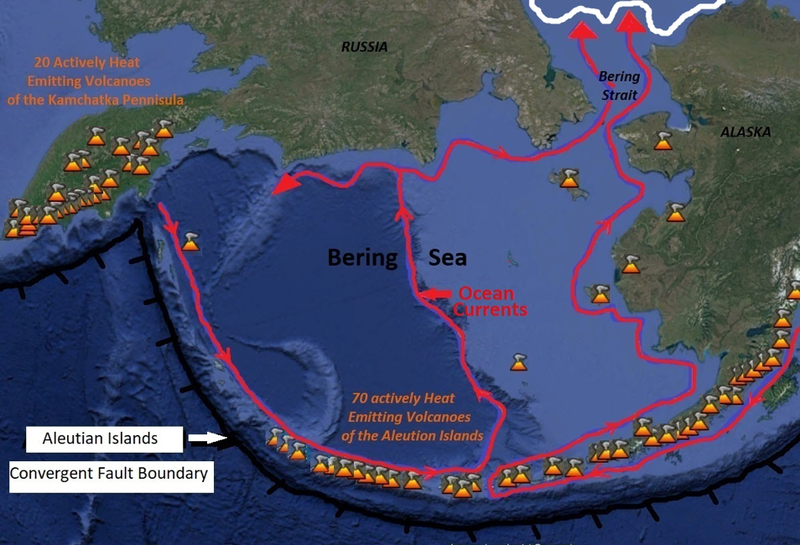 Lastly the southern and southwestern edges of the Bering Sea is home to; 100 actively heat flowing land volcanoes, countless ocean floor hydrothermal vents, and numerous ocean floor heat emitting minor faults. Figure 4: Map illustrating the nearly 100 actively heat flowing volcanoes that are fueled by the Aleutian Island Convergent Fault. These geological features act to warm the entire Bering Sea. This anomalously warmed seawater is then carried by know major ocean currents through the Bering Strait and into the western Arctic Ocean, where is acts to melt the western margin of the Arctic Sea Ice. El Nino's and La Nina's are anomalously warm followed by anomalously cool Pacific Ocean temperature cycles. These cycles act to dramatically alter earth's climate and many climate related events. For instance; droughts, heat waves, cold snowy winters, high precipitation summers, alter crop harvests, alter fish migration patterns, change major ocean currents, etc. It is here contended, and as detailed in many previous Climate Change Dispatch articles, that these El Nino / la Nina cycles are geological in origin (see here, here, here, and Addendum 1 base of article). All El Nino's and La Nina's form at the exact same fixed non-moving geological heat source point, the eastern coast of Papua New Guinea / Solomon Islands. This ocean floor location is one of the most active geological regions on earth. A map of this geological heat source point is shown in Figure 5 with an overlay of the 2015 El Nino ocean warming event (red shading, credit NOAA SST Maps). Figure 5 – NOAA Sea Surface Temperature (SST) map displaying the extent of the 2015 ocean warming event (red shading is anomalous warming) (credit NOAA). 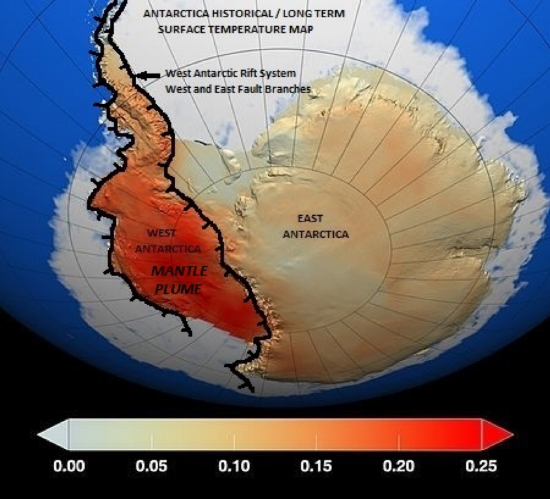 New research by NASA proves that a huge heat flowing and ice melting mantle plume lies under much of West Antarctica. This research has opened the proverbial floodgates concerning what force or forces control earth's climate. Global Warming / Climate Change is no longer the obvious choice. It is now reasonable, in fact necessary to re-evaluate the role major geological features such as mantle plumes, continental fault boundaries, and oceanic fault boundaries play in influencing or controlling earth's climate and climate related events. This article has provided very convincing evidence that geological forces are an underappreciated and powerful influencer of earth's climate and climate related events as per the Plate Climatology Theory. All El Niño's originate at the same fixed “point source”, east of Papua New Guinea. Recent deep-ocean temperature data from publications by Kessler et al proves that such a hotspot exists in this area. Additionally, very new data from a National Science Foundation funded ESA Satellite study shows that thousands of heretofore unrecognized seamounts (deep-ocean volcanoes) have been identified in the Papua New Guinea area. The Papua New Guinea / Solomon Island Heat Point Source Area is known to be one of the most active and complex ocean floor geological regions on earth. The shape of El Niño and La Nina sea surface temperature anomalies are unique / one of a kind. They retain a cone shaped and non-variable outline unlike all other ocean floor current and ocean induced weather events. The El Niño sea surface temperature anomalies have “linear” and “intense” boundaries inferring that the energy source is fixed / not moving and very powerful. Deep-ocean geologically induced hydrothermal vents are a very good mini-analogy of the larger El Niño's, because they are generated from a fixed non-moving geological heat point source. Large Continental volcanic eruptions are fair analogies of El Niño's, because they are generated from a fixed non-moving geological heat point source. El Niño's often occur in “bundles”, mimicking the “bundle” pattern of many major volcanic eruptions. The main point here is that El Niño's do not occur in an atmospherically predictable fashion. El Niño-like events do not occur elsewhere in Pacific. Why? If they are atmospheric in origin, there should at least be other mini-El Niño's. There are none. La Niña's originate from the same fixed non-moving point source as El Niño's. Atmospherically based El Niño prediction models consistently fail, likely because they are modeling the “effects” of geologically warmed oceans and therefore not the “cause” of the El Niño's. Historical records indicate that the first “recorded” El Niño occurred in 1525 observed by Spanish explorers. Other studies suggest strong ancient El Niño's ended Peruvian civilizations. The main point here is that strong El Niño's are natural, and not increasing in relationship to global warming as contended by many climate scientists. The Ontong Java Plateau is one of the world's largest oceanic volcanic plateaus. It covers 1% of earth's surface, or stated in another way, 77,000 square miles. Parts of this plateau are still very active today. The lava and heat source point of this volcanic plateau is the same heat source point for all El Nino's / La Nina's cycles. The fixed non-moving heat point source for all El Nino's lies along the "Pacific Ring of Fire". An active series of faults that ring the Pacific Ocean. El Niño's do not occur in an atmospherically predictable fashion. Changes in the atmospheric temperatures do not correspond with El Niño occurrences. http://www.newsweek.com/antarctica-melting-below-mantle-plume-almost-hot-yellowstone-supervolcano-705086 Newsweek "NASA DISCOVERS MANTLE PLUME ALMOST AS HOT AS YELLOWSTONE SUPERVOLCANO THAT'S MELTING ANTARCTICA FROM BELOW". http://www.newsweek.com/underwater-volcano-eruptions-guns-730046 One Million Sub-Sea Volcanoes and None are Monitored for heat, Methane, or CO2 Flow. http://volcano.oregonstate.edu/submarine One Million Undersea volcanoes. https://blogs.agu.org/fromaglaciersperspective/2017/12/08/muller-ice-shelf-antarctica-retreat-rift-zone-expansion/ West Antarctic Muller Glacier Melting Referred to as "Rift"
https://www.scientificamerican.com/article/nasa-satellite-reveals-source-of-el-nino-fueled-carbon-dioxide-spike/ NASA Study Strong El Nino Spike CO2 Except in Ocean where CO2 Dropped. https://en.wikipedia.org/wiki/Plate_tectonics Scientific Description of how major continental and oceanic segments (plates) move around and interact with each other (Continental Drift Theory). http://www.sciencedirect.com/science/article/pii/S0012821X02006167 Scientific article describing Greenland is broken into major pieces; continental fault bounded segments, oceanic fault bounded segments, and a mantle plume. https://phys.org/news/2017-02-hidden-lakes-west-antarctica-thwaites.html Flash Draining of Several West Antarctica Sub-glacial fresh liquid water lakes.